As we celebrate Black History Month, SACE is highlighting stories at the crossroads of energy and equity. 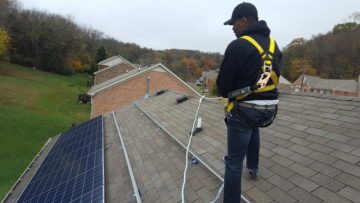 Through my own work to design and install my own solar rooftop photovoltaic (PV) system on my home, I’ve become very familiar with the challenges in Tennessee. I've also reflected on how current utility policy in Tennessee is unfair and inconsiderate of the poor, low, and limited income customers. Here I share my experience, lessons learned, and hopes for a more equitable system. As we celebrate Black History Month, SACE is highlighting stories at the crossroads of energy and equity. 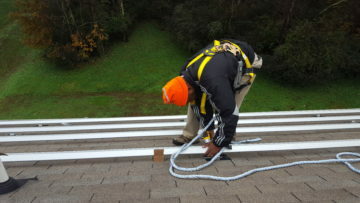 Through my own work to design and install my own solar rooftop photovoltaic (PV) system on my home, and also through experiencing the unexpected hurdles imposed by the Tennessee Valley Authority (TVA) that hinder my savings potential and subsequently my career pursuits, I’ve become very familiar with the challenges in Tennessee. I have learned many lessons about how energy policy and rate structure affects all electric customers. I’ve also reflected on how current utility policy in Tennessee is unfair and inconsiderate of the poor, low, and limited income customers. Here I share my experience, lessons learned, and hopes for a more equitable system. It is my hope that my story will encourage more Black folks to take an interest in energy issues and join me in helping our nation transition to a renewable, green economy; a Green New Deal. That’s me in the red hat. Today I’m the proud owner of a fully interconnected rooftop solar PV system. I remain a solar enthusiast and aspiring entrepreneur, and I feel a great sense of accomplishment for achieving my long-held dream of becoming certified and successfully installing my own system. The path I took to achieve these goals was long and not without roadblocks. 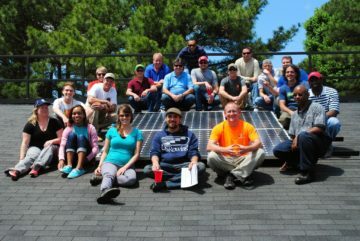 My family, my community, my friends and co-workers have supported me along this journey, but I have come to realize that misunderstanding and lack of information are still holding back adoption of solar PV, especially in African American communities in the south. These systemic problems are exacerbated – in Tennessee especially – by the combination of TVA’s low price paid for electricity generated from rooftop solar, and even more so by their ever increasing fixed fee structure that’s passed on to all of us. As a result, as reported in a recent article published in Solar Industry Magazine, black-majority neighborhoods are installing significantly less rooftop PV solar than their white-majority peers. The article cites a study, that even when controlled for median income and homeownership, still found that black neighborhoods have 69% less residential rooftop solar power than no-majority neighborhoods, and are behind Hispanic and White neighborhoods in adoption of rooftop solar. This infers that education, outreach and pilot projects must be a priority if we want to close the gap and begin solving some of our deeply rooted energy equity issues. I can think of no better place to start than in the great state of Tennessee. That’s me in the orange cap. For over a decade I have been a solar power enthusiast. My background in the heating & cooling industry exposed me to Leadership in Energy & Environmental Design (LEED) certification and renewable energy, specifically solar PV, which sparked my interest to say the least. I looked more deeply into what it would take to install PV on my own home – and taking into consideration the state and federal incentives (circa 2008), I decided that the time was right and the momentum was there to be a part of the movement to advance solar power. In hindsight, my experiences in the solar industry as an installer and now as an advocate and organizer, have allowed me to witness barriers firsthand on many levels: in my own career, in the communities I serve, and at the state and federal policy level as well. In 2010, I was frustrated, but not surprised, to find out that although I lived in Nashville, there was no option for me to take the North American Board of Certified Energy Practitioners (NABCEP) exam locally, and that in fact no major Tennessee city offered it, yet it was a requirement for anyone aspiring to participate in TVA’s incentive programs. My journey to solar power production therefore included traveling from Nashville to Raleigh, NC twice to take the exam. Upon receiving the news that I did not pass the exam on the first try, I was devastated, but I was not willing to be defeated. Thankfully, my wife and my friends supported me in my decision to leave home for another week, two years later, and it paid off when I passed the exam. The certification provided me with TVA approval to design systems and access to the incentives in their Green Power Providers program. I felt positively optimistic that I would install a solar PV system on my home and realize all the savings that the incentives promised. It would be the fairy tale solar story. Over the course of more than 3 years, I gathered components from various sources, looked for deals online, and used an online app to help me generate the diagram required for my permit application. 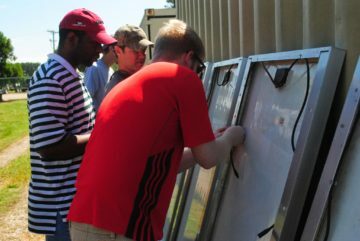 I enlisted the help of a veteran of the solar industry to consult with me through the process. I installed my system and worked to get approval from my local power provider, Nashville Electric Service (NES). To this day, it is my understanding that I am the only African-American in the State of Tennessee with NABCEP certification. Once I finalized my system, I eagerly awaited my first bill – I could hardly contain my excitement at the thought of all of the SAVINGS I just knew were heading my way. But sadly, by this point, TVA’s Green Power Providers Program, which initially paid customers 15 cents more than retail rates per kilowatt of electricity produced by home systems, had expired. The incentive was gone. What’s worse is, today, TVA pays residential customers less than retail per kilowatt of solar power produced. TVA is essentially making the argument that the power they sell us is worth more than the power we produce ourselves, watt for watt. The problem is, we oftentimes don’t have a very loud voice in this argument. To add insult to injury, TVA has increased its fixed fees 50% since 2011, and will likely raise them even more in coming months and years. TVA’s “Grid Access Charge” is a fee every customer pays to TVA for the “privilege” of connecting to the power grid. The fixed fee is charged to every local TVA distributor company (including NES and its peers across the state), monthly. The local companies in turn pass the cost to their own customers (like me), regardless of energy use. Fixed fees disqualify and discourage investment for many Tennesseans; it makes solar PV adoption downright prohibitive for African-Americans. In 2015, the Solar Foundation found that 0% of African Americans were employed in the solar industry in Tennessee. It is my goal is to open doors so that people in every community have access to the information and resources they need to install solar PV close to where they live and to increase education and outreach by teaching students to design and install solar PV systems. But I also recognize that education is only half the battle. With energy bills on the rise regardless of use, how can we expect customers to choose energy investments like rooftop solar over basic living expenses? I’m proud to work alongside my colleagues at SACE and Renew Tennessee in the fight against fixed fees throughout Tennessee – We are working from Memphis to Knoxville to bring public attention to these charges, which inhibit customers, especially those with low or fixed incomes, from controlling their energy expenses. Together we will promote clean energy solutions that reduce emissions, lower electric bills, and put customers back in control – Join Us! That’s not me…but it’s my house.